As many of you know, I work in public accounting. By default, that means April is busy. To make things even busier, I am part of our personal tax pool at work – essentially preparing personal taxes for the whole month. This translates to 11 or 12 hour work days all month. I actually really enjoy personal taxes, love the change for a month and interacting closely with clients. However the hours are tiring, especially with 3 months of our busiest season already behind me… So I apologize if my blog posts have not been as frequent lately. If you’re as stretched for time as me, you are probably always on the hunt for quick (but delicious) recipes. This fig compote is amazing. Our fantastic instructor, Erin Howe, shared it with us at the NAIT Valentine’s Day cooking class and I have made it for so many people since. The compote is so simple to make – you take dried figs, brown sugar, red wine and thyme and reduce the mixture until the majority of the wine has been simmered off and the mixture thickens. Once the mixture cools, add a bit of good quality balsamic vinegar. During the class, we used Dark Chocolate balsamic vinegar from Evoolution in Edmonton and it definitely made a strong impression on me. 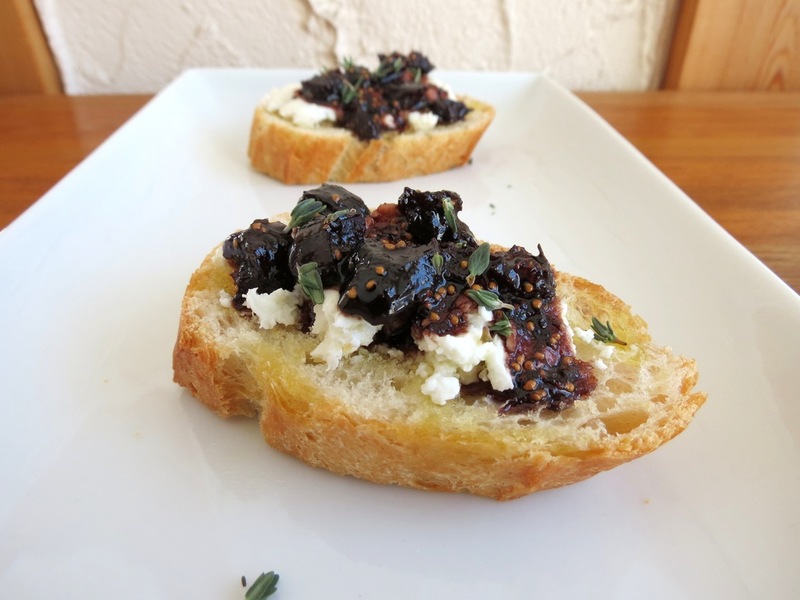 The rich, sweet cocoa flavour pairs perfectly with the figs and goat cheese! When I was re-creating the appetizer on my own, I decided not to skimp out on the balsamic and stopped by Evoolution to pick up a bottle of the chocolate goodness. That was my first time in Evoolution and I was in heaven! This cute boutique store specializes in olive oil, vinegars and salts and carries everything from traditional flavours to exotic ones like coconut, truffle and blackberry ginger. Oh yea, and did I mention they’re a tasting bar? Yup, you can just go in, try a dozen flavours and get inspired for your next food adventure – truly a foodie’s heaven! 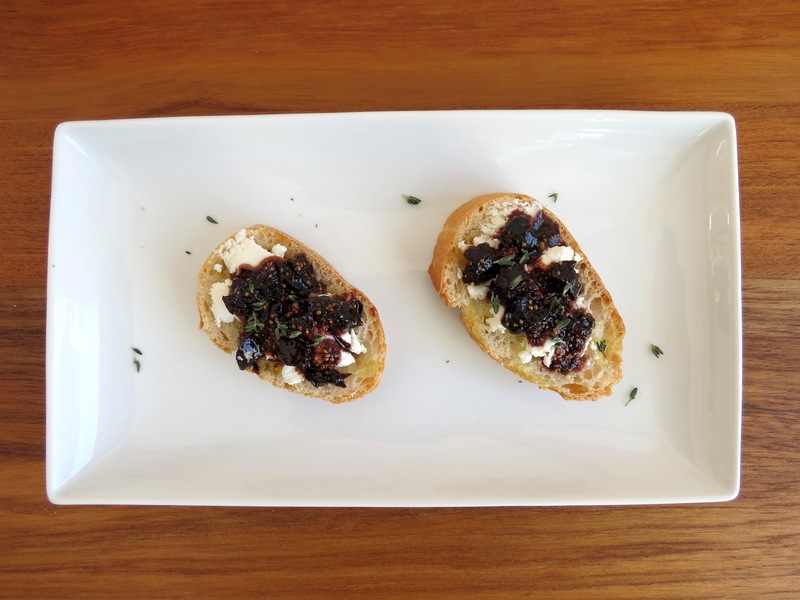 Ok, back to the fig compote… after you add the balsamic, your compote is ready to serve on baguette bread with goat cheese and fresh thyme. It’s so easy and a great appetizer for entertaining or having friends over for a movie night. Combine figs, brown sugar, wine and thyme in a small saucepot. Bring to a boil and then reduce heat to medium-low. Simmer for about 15 minutes or until the mixture thickens. The mixture will continue to thicken once it cools. Allow the mixture to come to room temperature. Add in the balsamic vinegar. Drizzle your baguette with olive oil and bake until light golden. 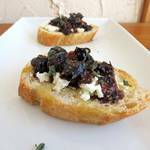 Spread goat cheese on each baguette slice, top with compote and garnish with lots of fresh thyme.